Running back Ray Rice addresses a news conference at the Baltimore Ravens’ training center on May 23, 2014, in Owings Mills, Md. 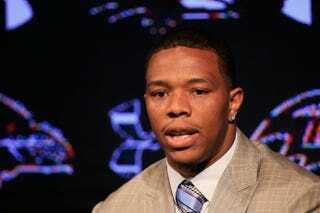 Former Baltimore Ravens running back Ray Rice’s fall did not take long. Following his termination from the Ravens and his indefinite suspension from the NFL, marketers and sponsors have begun to wash their hands of the player, who was seen on video punching his then-fiancee, Janay Palmer, out cold in an elevator. One Fox Sports 1 reporter tweeted that a source informed him that EA Sports, the video game franchise, will drop the player from its recently released “Madden NFL ’15,” according to CBS News. The Associated Press reported that the brand pointed to Rice’s indefinite suspension from the NFL as terms for his removal from the popular game line. As CBS notes, big-name companies have already cut ties with the disgraced player. Nike announced Tuesday that Rice would no longer be collaborating with it. According to ESPN, the Ravens have gone so far as to give fans the opportunity to exchange any Rice jersey at their stadium stores, although it is unclear how the exchange will work and how fans will be reimbursed.